Many woodworking projects, such as roundtable tops or archways, call for a precise, rounded cut—the kind that cannot be consistently cut by eye with a band saw or jigsaw. To cut precise circular shapes requires a jig. In this tutorial, we walk you step-by-step through the process of building and using a circle-cutting jig for the band saw. While router-based jigs can be useful for this process, band saw circle-cutting jigs like this one can be easier to use. The essence of the project is to build on an oversized plywood table that will rest over the metal table of your band saw. Into the plywood table, you will attach a pivot pin, which becomes the center of the curve on whatever workpiece you want to cut on your band saw. By position the pivot pin at different locations, you can cut circular workpieces with whatever radius you want. To begin this woodworking project, measure the width of your band saw table (parallel to the blade). Using a circular saw or table saw, rip the plywood to a width about 3 inches wider than this distance. This will provide you with a 4-ft long jig that is slightly wider than your band saw table. Next, measure the perpendicular distance from your band saw's blade to the side of the table. Mark this distance onto the plywood, measuring from one edge. Cut a length of 1 x 2 the width of the plywood, and attach it at the mark with wood screws. This is a cleat that will allow you to attach the jig to your band saw table. After the plywood has been ripped and the cleat has been attached, the next step is to attach two additional cleats that will be also be used to clamp the jig to the band saw. Cut two short sections of 1 x 2 and place one on each side of the bottom of the plywood between the main cleat (that was attached in the previous step) and the end of the plywood closest to the cleat. These cleats will help stabilize the jig when it is in use. Now that the cleats have been attached, the next step is to attach the two legs. Cut a section of 1 x 2 the width of the plywood, and attach this piece to the bottom of the two 2 x 4 sections, as shown in the photo. This will act as a bottom foot to help stabilize the legs. With the leg assembly completed, we'll attach the legs to the plywood table. In this step you have two options, you can connect the legs with hinges that will allow the legs to fold underneath the table when it is stored, or you can simply drive a couple of screws through the table into the legs, and remove the screws when disassembling the circle-cutting jig. As shown in the image on this page, we've chosen to use the latter method, using some 2-inch deck screws to connect the legs to the plywood. The woodworking steps for the circle cutting jig are now complete. In this step, we'll clamp the jig to the band saw's table to help secure it for use. Position the jig in place over the band saw table, and secure the jig with spring clamps attached to hold the cleats to the band saw table. With two clamps on the main cleat, attach one clamp to each side cleat as shown in this photo. These two additional clamps will help stabilize the circle-cutting jig when you use it to cut stock. With the jig secure, the next step is to scribe a center line down the length of the jig. This centerline will be used to position pivot pins, around which the workpiece being cut will turn. On the side of the jig that touches the band saw's blade, measure the distance from one edge of the jig to the center of the blade. Mark this location with a pencil mark. Then make a similar mark four feet away on the opposite end of the jig's table. Now, with a straightedge, scribe a pencil line between these two marks. You should now have a line extending from the blade out to the end of the jig. When you're ready to use your circle cutting jig, you need to know the desired radius of the circular piece needed for your woodworking project. You will position a pivot pin into your jig at a distance that matches the radius of the curve on your workpiece. We'll be using a 4d finish nail as our pivot pin. With a drill, bore a hole slightly smaller than the 4d nail in the center of the workpiece being cut. Ideally, this hole should be positioned at the radius distance from one of the edges of the workpiece. Unless the project will need a through-hole in this location, you'll only want to drill the hole partially through the workpiece, no more than 1/4 inch deep. Next, you'll need to drill a similar hole in the jig on the center line you scribed in the last step. Measure the length of the desired radius from the band saw blade and make a pencil mark on the center line to denote the pin position. Then, drill a hole with the same bit you used on the stock, but all the way through the jig's table. Once the hole is drilled, tap a 4d finish nail up from underneath the jig through the hole until it is nearly 1/4" above the table. Align the workpiece with the hole on the pin and against the edge of the band saw blade. Tap the workpiece down onto the pin until it is flat on the jig's table. With the workpiece in place on the circle-cutting jig, adjust the blade guard downward until it is just above the workpiece being cut. After making any adjustments to the band saw, turn on the motor and wait for the blade to reach full speed. Ease the workpiece through the blade, rotating it around the pin, until the entire circular shape has been cut. Be sure to hold the workpiece flat on the table as it turns. 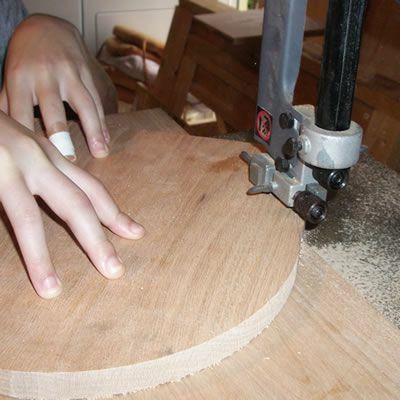 When the cut is complete, turn off the band saw before removing any cutoffs. Then lift the workpiece off of the pin. If no other cuts are needed, remove the 4d nail from the jig before disassembling the unit. You should now have a nearly perfectly circular cut piece of stock. Sand the curved cuts and use in your woodworking project as desired.